(!) If you are using Acronis True Image Home 2010 with Plus Pack, see Acronis True Image Home 2010 Throws Errors in Application Event Log (Source: SideBySide, Event ID: 33) on Windows 7. Activation context generation failed for ""C:\Program Files(x86)\Acronis\TrueImageHome\BartPE\Files\TrueImage.exe"". Dependent AssemblyMicrosoft.VC80.CRT,processorArchitecture=""x86"",type=""win32"",version=""8.0.50727.762"" could not be found. Please use sxstrace.exe for detailed diagnosis." The error is caused by the WinPE plug-in of Acronis True Image Home 2011 using different manifests than Acronis True Image Home 2011 itself. If you intend to use Acronis BartPE plug-in, you can safely ignore the messages. Delete the original BartPE folder. This will not affect the product's functionality. You will only not be able to use Acronis BartPE plug-in, unless you unpack it back. Feel free to contact Acronis Customer Central if you have further questions. 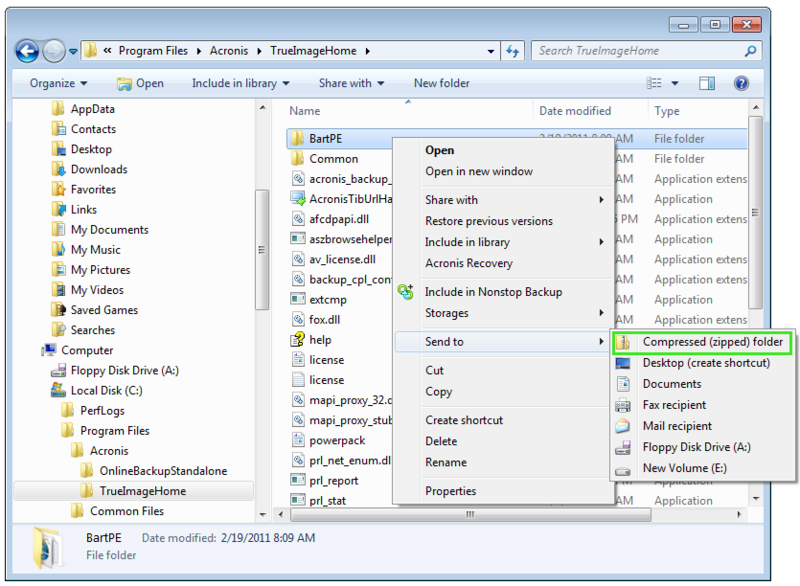 For information about Acronis BartPE plug-in please see Working with Acronis True Image Plug-In for BartPE.